Jesse Winker is used to a certain amount of baseball activities in the outfield, but hitting isn't one of them. 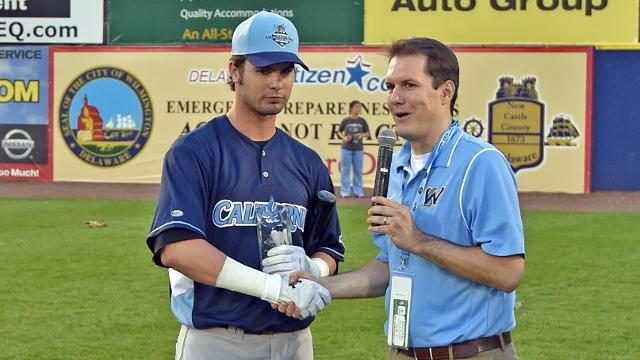 A participant in Monday's Carolina/California League All-Star Game festivities, the Reds' third-ranked prospect won the unconventional Home Run Derby at Frawley Stadium in Wilmington, Delaware. Batters took swings near the warning track in center field and aimed for the crowd gathered in the stands from one dugout to the other around home plate. "It was a blast to be a part of something like that, and it's just an honor to be here at the All-Star Game," said Winker, a left fielder for Class A Advanced Bakersfield. "It was a reverse home run derby. That was the first time doing something like that. It was just really cool and really fun to be a part of." With five home runs, the 20-year-old edged Visalia's Brandon Drury, who finished with four long balls. Four Delaware high schoolers also took part, with Chad Bell of Hodgson sending one out. "It was just a different look," Winker said. "Once you kind of get in your groove, it's the same. But the dimensions were a little different, so it wasn't as much of like a pull home run derby, you know, because it was kind of up the middle. They wanted to get 'em up to the bleachers." The derby was not the only skills test of the night. There was also a hitting challenge, pitting six All-Stars from each league against each other, with each team being led by a local media personality. The California League team -- comprised of Lancaster's Carlos Correa (No. 1 Houston prospect), Rancho Cucamonga's Corey Seager (top Dodgers prospect), High Desert's Gabriel Guerrero (No. 10 Mariners prospect), Lake Elsinore's Diego Goris, Bakersfield's Kyle Waldrop and Lancaster's Anthony Kemp -- overcame the Carolina League squad, 2,180-2,130. Points were accumulated by participants hitting various targets while avoiding defensive-minded mascots strewn around the field over a minute's time. Waldrop accounted for 485 points by himself. Myrtle Beach's Jorge Alfaro, the Rangers' top prospect, came in second with 460 points. Johnny Damon -- who played 119 games for Wilmington in 1994 -- took a few cuts during the competition, a day before his jersey was set to be retired by the host Blue Rocks. That will happen before the leagues' midsummer classic, which begins at 7:05 p.m. ET on Tuesday. Bakersfield's Ben Lively -- the Reds' No. 12 prospect -- starts for the West, opposite Carolina's Ryan Merritt. If Monday was any indication, Tuesday could go very well for the California League All-Stars. "We want to win, that's for sure," Winker said. "We're going for a clean sweep between the hitting challenge, the derby and the game. So, hopefully we can go 3-for-3."